If you’ve been lost in the woods for hours or even overnight, you know how quickly hunger can set in. According to all the experts, the average human can survive up to 3 weeks or longer without food. I guarantee most of us will be trying to convince our stomachs we aren’t dying after five or six hours without the snacks it’s accustomed to getting at regular intervals. So, as you wander through the forest, surrounded by pine trees, and realize that even if you can get your bearings you’re hours from your refrigerator, your stomach may have you wondering can you eat pine cones or not? What is a Pine Cone? If you’re going to try to eat a pine cone, you should first know a little bit about what a pine cone is and isn’t. Pine trees are coniferous trees. Coniferous trees are found in the Northern hemisphere, including Europe, Asia, and North America. Forests of coniferous trees are referred to as boreal forests or taiga. 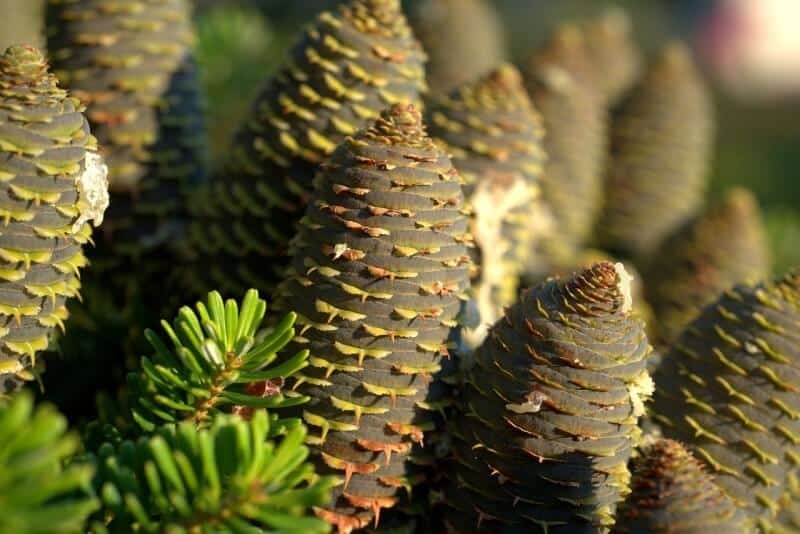 Over five hundred trees of various colors and shapes are classified as conifers and produce cones, not flowers, to develop and protect their seeds. So, all trees in the conifer family, including hemlocks, spruce, cedars, firs, and pine will produce cones. These cones are essentially the hard outer shell of a seed pod. It’s the seeds inside that are most desirable. But “pine cones” are exclusive to pine trees. Cones can be male or female, and are typically found on the same tree. Female cones carry the seeds. Male pine cones are almost cylindrical in shape and narrower than female pine cones. They are smaller, and softer than female pine cones most people are familiar with and almost resemble mini corn cobs. Pollen is released by male pine cones and is carried by the breeze to female cones. So the first thing you need to know is not all “cones” are pine cones. Just remember, pine cones grow on pine trees, makes sense, right? This is not medical or nutritional advice. Neither the author, the website publishing this article or the company behind the website shall be held liable for any injuries, side effects or even death as a direct or indirect result of the application of the principles in this article. The advice given in this article is for information purposes ONLY. Before you can decide whether or not to eat a pine cone, you need to know how to find find some pine trees. Found on the west coast, the sugar pine is one of the tallest edible pine trees in North America, reaching upwards of more than 200 feet and higher. The longest pine cones, more than 2 feet long, come from the Sugar Pine. On the other side of the U.S., you’ll find the Eastern White Pine, which grows to over 200 foot and is found near the Appalachian mountains, north through Pennsylvania and as far as southeastern Canada. The smallest pines are the Potosi Pinyon, native to parts of Mexico, and the Siberian Dwarf Pine, found in Siberia. Pine cones from pine trees come in various sizes too. Coulter Pines in Baja California are the biggest, some of those pine cones weigh more than 5 pounds and have scales that resemble daggers. These are referred to as “widow makers”, because, well just imagine the damage it could do if one fell on your head as you walked underneath it. Pine cones certainly don’t seem edible, do they? They are cone-shaped, pretty hard, and can be a little prickly if you hold them the wrong way. Well, the male pine cones are smaller and softer, but still, who in their right mind would think you can eat pine cones? In truth, pine cones were once a prized part of the dinosaur diet, especially for the “duckbill dinosaurs” or Parasaurolophus, whose rows of teeth were capable of chewing the tough pine cones. And of course pine cones are a favorite food source for many types of animals, including woodpeckers, crossbills, and squirrels. Pine needles and seeds are a food source for turkey, pheasant, and wood duck. Okay, so dinosaurs ate pine cones. Many animals feed on pine cones. But does that mean the average human can eat pine cones or not? So, Can People Eat Pine Cones or What? The truth is that all parts of certain pine trees, including the pine cone, are indeed edible. This includes: pine cones, needles, the inner layer of pine bark (not the outer layer! ), resin, the pine pollen (secret superfood! ), and the pine nuts. The pine cone may not be the best part to eat, but you can eat it. Unlike the dinosaurs, your teeth will have a tough time chewing it though. It’s best to grind pine cones or at least boil them to make them softer. And no matter how you prepare them or eat pine cones, they are a terrific source of fiber and Vitamin C. The seeds or pine nuts, which we’ll discuss in a later section, are much easier and tastier to eat though, and are also a great source of vitamins and minerals. Yew trees have straight needles that are flat and round and feather out; They also produce berry-looking structures not cones. Norfolk Island Pine is a conifer but not a true pine found on Norfolk Island in the South Pacific Ocean. Ponderosa Pines (also known as Blackjack Pine, Bull Pine or Western Yellow Pine) have long, fan-shaped needles. You’ll typically find cones covering the ground beneath a Ponderosa Pine. Look for soft bundles of rounded needles in bunches of 2, 3, or 5. If the tree has single needles, it’s probably a spruce or fir. Pine needles are really soft and can grow to as much as 16 inches in length. In comparison, spruce tree needles are square and much shorter and rigid and originate from a single stalk-like point on the branch. Fir tree needles are soft like pine needles but they are flat not round. Fir needles grow from a single point like the spruce but the point of attachment on the branch resembles a suction cup. Most fir needles also have white stripes on the bottom. Check the branches and pine cones of the tree in question. The branches on a pine tree will be less than the number of branches on a fir or spruce tree. Branches on a pine tree also typically originate from a single, circular part of the tree trunk. Pine cones are green as they start to develop, but then turn reddish-brown or black. You’re getting good at this now, so here’s the short and sweet tip. Look for trees with a jagged triangular shape. If it looks like a classic bushy Christmas tree, it’s probably a spruce or a fir. If the pine cones are rigid and hard rather than thin and flexible, it’s likely a pine. Okay, now that you’re sure you’re looking at an actual pine tree with pine cones, let’s talk about how to harvest and eat the different parts of the pine tree. You always want to harvest plants in the most responsible way in order to do the least amount of damage to the health of the tree. These aren’t the tastiest part of the pine tree. The best way to eat pine cones in a survival situation is to boil them to soften them. They can also be used as an Edible Garnish (choose young tender green pine cones). If you’re looking to use the pine cone for its healing properties, make Pine Cone Jam (long used in countries such as Russia, Ukraine, and Georgia) by boiling the softer green pine cones. It’s used to boost the immune system, treat bronchitis, asthma, cough, TB, cancers, arthritis, and respiratory diseases. Throughout the world, there are 20 different types of pine trees with cones big enough to harvest pine nuts from. Nearly 95% of commercial pine nuts, (the ones most of us have bought and eaten), actually come from Korea and China. The best time to harvest pine nuts is in the fall, especially September and October. Pine nuts are ripe for harvest about 10 days prior to the cone opening. You can boost the process by placing harvested cones in a burlap bag in the sun. All parts of a pine tree, however you prepare and eat it will give you a nice amount of fiber and Vitamin C.
Pine needles are indeed edible, and are similar to rosemary in texture. The needles on the spruce and the fir trees are edible as well. The pine needles of younger trees have a milder flavor that is better for cooking. To harvest, first be certain the area has not been sprayed with any pesticides or chemicals. Then gather small amounts of needles from several different trees. Pine Needle Tea made from steeping a spoonful of crushed pine nuts in hot water for up to 10 minutes. Pine needle tea is high in Vitamin A and contains 4x more Vitamin C of orange juice. It can work in the body as a diuretic, to aid regeneration of skin, and boost red blood cell production..
It’s also used as an expectorant for coughs, or for sore throats. In a long term survival scenario, a tea made from pine needles can be used to help prevent scurvy. Choose pine trees that are mature, some pines grow for up to 200 years. Older pine trees will have more inner bark and harvesting mature trees helps to minimize negative impact on the tree. Once you find a fresh, live tree, cut small strips from the inner bark, or cambium, using a knife. Avoid gouging large pieces of bark as it can leave the tree vulnerable to disease and kill it. Edible inner barks include eastern white pine, slippery elm, yellow birch, red spruce, tamarack, balsam fir, and black spruce. On the eastern pine, the inner layer of bark furthest from the outside bark is almost sweet. In a camping or survival scenario, you can use a pan to fry the bark in oil or roast thin strips of bark on a flat rock over the fire. Inner bark can also be roasted until golden and then ground as a flour substitute to thicken soups or make bread. This is in fact the superfood of the pine tree. Pine pollen is great for boosting your immune system and is a phenomenal source of vitamins and minerals. Harvest pine pollen from about April to July when you can see it in the air. Place a plastic bag over the smaller male cones to collect the powdery, yellow dust. Use pine pollen powder in cooking or make a pine pollen tincture. Have you ever tried to eat pine cones or another part of a pine tree? Tell us in the comments below which parts of the pine tree are your favorite. 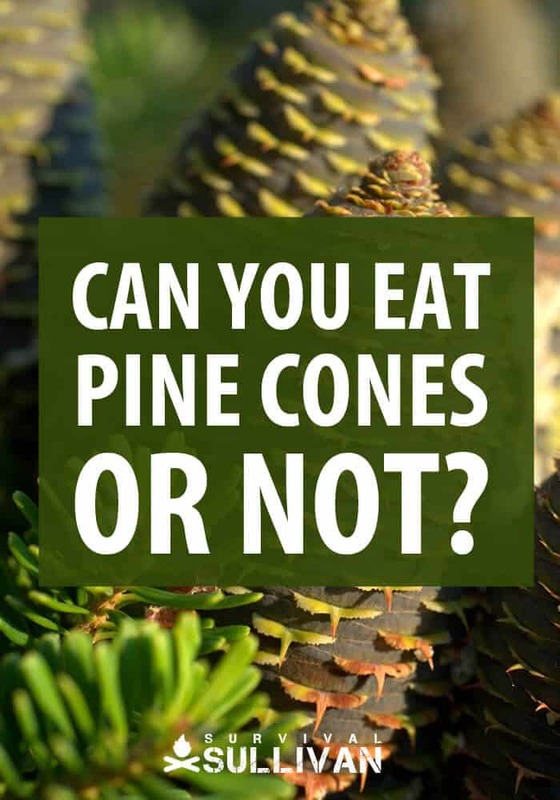 Did you learn anything new from this article about whether you can eat pine cones or not? We’d love to hear your comments. Very interesting,enjoyed reading it, would like to read more on the same type subjects. Good luck trying to take a dump after eating a few pine cones. Better have some lard close by to ‘help’.